JOSERA is a leading specialist in animal nutrition based in Germany. The company wanted to create a marketing campaign that would serve two goals: generate new customers for their line of pet food products and drive business to their retail locations. To meet this goal, JOSERA adopted GEOservices from locr to create highly personalized weekly marketing campaigns. The campaign starts when the prospect visits the company website and orders a “probe pack” or samples of pet food. At the site, they enter their name and address, as well as some information about the pet. These prospect addresses are then processed at locr. The data is geocoded and matched with JOSERA’s existing list of retailers. For every address, the nearest two JOSERA specialized dealers are determined. The map material produced by locr and the JOSERA database are forwarded to the printer Grunewald in Kassel, Germany, for printing. Personalization is also an important part of the campaign. The customer’s name – as well as the name of the pet – is printed on the letter. 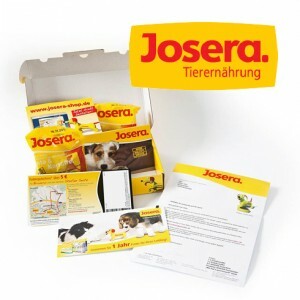 To show prospects where they can buy the product, the voucher included in the campaign contains a personalized map that directs them to the locations of the two nearest JOSERA retailers. All of these materials, along with the product samples, are arranged in a client-specific promotion box. Using locr GEOanalytics to calculate the distance and journey time from the prospect to the closest retail location provides valuable data that can show JOSERA new regions where specialized dealers can be established. In addition, JOSERA can also analyze the number of clients assigned to one retail location or the distance to the location where the clients live. The campaign’s high conversion rate proves its success. Including geo-based personalization in the campaign helped to increase conversion rates by 3%. In addition, JOSERA retailers are pleased with the increase in business they are experiencing at their locations.